Since the 1970s, generations of travellers have told wondrous tales of the Annapurna circuit. 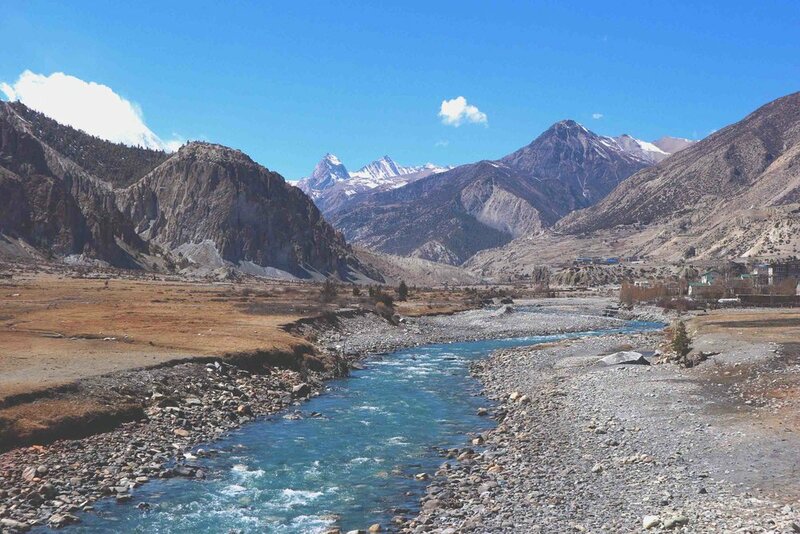 Tales of a trek that can last up to 3 whole months in dizzyingly high altitude in the Himalayas, we were intrigued. We first heard about it from a couple we met in Laos, they had just completed the circuit and were clearly in awe so we did some research to find out what all the fuss was about. It seems quite silly that we hadn’t heard of it until a few months ago, it's one of the most popular circuits in world! This became all-so-clear upon our arrival in Nepal, this country is a mecca for trekking and the Annapurna circuit is the perfect breeding ground for adventures, new walking friends and the highest mountains in the world. Annapurna has truly stunning and dynamic landscapes that change every day of the route. It's hard to believe you can find both jungle and artic tundra just a few days walk away! This is the holy grail of the great outdoors, so here are 20 images that will make you want to strap your boots on, pack your thermals and go tackle the infamous Annapurna Circuit. I’m not sure there’s anywhere in the world that can make you feel quite so small as the Himal and Annapurna mountains. Even after weeks of trekking, the mountain’s scale still takes your breath away, but not as much as the air-thinning experience of climbing to the top of one! Let it not snow, if truth be told. The Thorang-La pass is scary and dangerous enough without a snow storm and after 10 days of perfect blue skies, it was an un-wanted surprise that a storm hit for the morning of the pass. Although, on reflection, the snow actually made the experience more memorable and certainly more challenging. The ever changing weather of the Himalayas is part of the package and clearing the top of the pass in a blizzard will be a story for the grandkids. If you take the yellow side-route up into the mountains above Khudi, you’ll find homestays run by warm and welcoming self-sufficient families. As well as feeding and providing shelter for you, they may also bless you with a Tibetan sash and milky rice stuck to your forehead. Ali was so touched by our host's blessing she became overwhelmed by emotion. It had been 3 rough days of recovering from food poisoning, and the well wishes were the light at the end of the tunnel. Most of Nepal is Hindu, 80% to be precise, but in mountain communities most are Buddhist and nothing symbolises the simplicity and beauty of Buddhist belief like the coloured flags with Tibetan scripture on them, flapping in the wind. Nothing brings people together like a challenge, tough environments and relentless Daal Bhat for dinner every evening. The Annapurna circuit attracts all ages of like-minded people, it's really easy to meet walking buddies and with new pals comes fun, good chats and high moral for the more challenging parts like the pass. After 8 months of travelling we felt confident we’d experienced much of the world's harshest weather, wrong! Himalayan storms, caused by tornados in warmer places, are brutal, long and pretty scary experiences. You can hear them thundering hours before they hit but when they do…oh boy! Walking the mountain paths takes you through villages and communities, so you can expect to walk into a few ragamuffins’ like these scruffy girls playing games in the village. Expect many greetings on the circuit from little mouths, “Namaste” echoing from village to village. When an environment is challenging, communities come together. Passing through villages and observing generations of families still following long practiced religious rituals on a daily basis is very special. Why not get involved and spin the Buddhist wheels of luck, clockwise that is. After days of gradually getting closer to the Annapurna mountains you’ll suddenly find yourself in ever-changing environments. The beautiful pine forests on the way to Lower Pisang made us feel like we just walked into another national park, this can happen a lot on the Annapurna circuit! Whether you’re on your own, in group or with a friend you must take some time to just stare at the mountains. It’s not very likely that you will find many taller or more beautiful, it’s the perfect excuse to rest your weary pins before the next ascent. As you leave Manang you will find the landscape starts to tear open in all directions. Aqua lakes form from snow run off, grass turns to brown steppe and the paths split into the different routes. It’s the perfect vista to remember the trek by and, in our opinion, it’s the most beautiful part of the circuit. Follow the river, it always takes you somewhere interesting. In this case, the path leads to Tilicho Lake which is the highest lake in the world. It takes a whole day of walking to reach Tilicho base camp, but with views like this on the way you’ll be completely mesmerised. There are few things that never leave your side on the trek. Luckily for Ali one of those things is me! But just as important is your backpack. It’s a heavy yet vital piece of equipment, but when you get to throw it down, rest your body and look back at what you’ve conquered, it makes carrying 12kg all the more bearable. Although Ali almost let her bag roll of a mountain edge, twice! As you climb above 3000 metres, you’ll start to spot ancient villages built from local stones that blend seamlessly with dusty rocky steppe on the way to Thorang-La. Take time to walk through these townships and admire how people survived in this challenging high altitude environment, many years ago. It sounds a little scary, and it is a little scary. To reach Tilicho lake you’ll pass through a falling rock area where small rocks hurtle south like they’ve come from Federra’s tennis racket. The sheer force of the moving rocks create stunning, almost abstract, shapes of colour down to the base of the ravine. Who wouldn’t want to set eyes on the highest lake in the world? It was a gruelling 3 hour walk on a disintegrating path with thick snow, but reaching 5014 meters high, short on breath with a view of the Annapurna mountains one side and the lake the other has been one of life’s greatest achievements. It’s also the perfect practice for the high altitude pass…. Unlike in many other countries, you’ll rarely need to queue to enjoy an amazing viewpoint. After taking the side route through Upper Khangsar we stumbled onto this uninhabited view point over the Manang valley. It would have been rude not to take a picture of Ali enjoying the view from the edge of a very high cliff. After 4 gruelling hours of air-constrained climbing up the slippery paths in the snow, we finally made it to 5416 metres above sea level and here’s the photo to prove it! It’s truly one of the hardest things you can do but its worth every second. 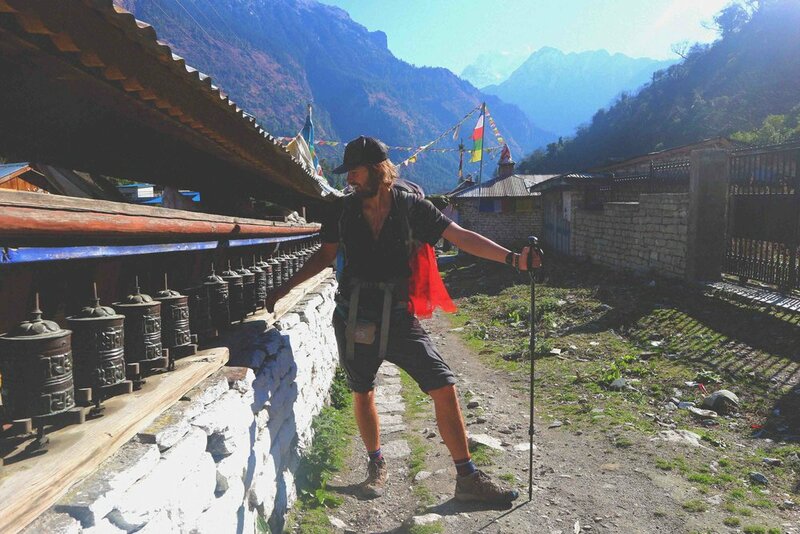 You’ll feel like an absolute hero until you realise that the Nepalese shop owner in the hut next to us endures the same walk everyday to sell tourists hot drinks! Once you’re over the pass the landscape changes dramatically. Everything gets larger and more spaced out and the rocks turn a dirty brown as desert starts to take over the land. You can sit and watch the clouds for hours as they dance over the huge rock sculptures below. The Nepali steppe isn't everyones favourite, most trekkers skip it by taking a jeep down to the greener bits of the circuit further south. For us, we love the desolate sombre colours of the Nepali steppe, dust filled, spiky shrubs and barely another soul in sight. It’s another day of adventure on the Annapurna circuit as we cross the steppe. We've trekked in many countries but very few compare to the sheer epic beauty of Nepal's Annapurna and Himalayan mountains. We fought with illness, altitude sickness and battered bodies to complete the 3 week trek, but it was worth it. It was amazing and we'd do it again in a second if we could, we might even come back next year if we can afford to! If you do only one multi day trek in your life make it the Annapurna circuit.